Why Should You Purchase a Water Softener? Do you have an itchy scalp? Clothing look grey or soap streaked? Are your building’s water pipes breaking down for no apparent reason? Your water may be to blame. Municipal water supplies are required to be safe for consumption, but depending on where you live the water supply can accumulate chemicals, which can be damaging for your appliances, laundry and skin. A water softener removes the chemicals in hard water, and makes the water “softer.” The most popular type of water softener is an ion exchange unit, otherwise known as a cation exchange water softener. There are also salt-based ion-exchange softeners, salt-free water softeners and dual tank water softeners. How Does Hard Water Effect You? Hard water is a major nuisance when it comes to self care and care of your home. That’s only half of the problem, however. What hard water does to your plumbing is the unseen negative effect. Minerals and scale from hard water build up on the insides of pipes and appliances. This has the immediate effect of restricting water flow. If water isn’t coming out of your faucets like it used to, their could be a mineral coating inside the pipes that’s preventing uninhibited flow. Over time, the effects on pipes are worse. The chemicals could fully clog your pipes, and cause wear and tear which shortens their lifespan. Your appliances will operate less efficiently, having to strain through the presence of mineral buildup. A water heater will have to work doubly hard, heating the buildup as well as the water. This is more difficult on the environment and your monthly bills. You may have noticed white streaks on your clothing if washing them in hard water. Hard water isn’t as effective in washing away soap as soap water, as the calcium and magnesium diminish soap’s cleaning capacity. It takes more soap and longer cleaning times to get the job done, and even so hard water can leave it’s signature streaks, spots and residue on clothing. Such inefficient washing means you’ll spend more on soap and overall utilities, still with an inferior result. Your glassware can even become brittle from the beating it takes from hard water chemicals. Not exactly the best news for your fine wine glasses. Soft water leaves your skin and clothing feel softer and cleaner. You’ll notice a great difference in your skin in switching from hard to soft water. Skin remains more supple and better hydrated in soft water, resulting in a younger and healthier look. Testing for hard water is easier than you might think; there’s a very low-tech way to do it. Grab a jar and fill it with your tap water. Next, add a few drops of dish soap. Seal the jar and shake it up for a while. If no suds are produced, you very likely have hard water. Chances are, however, you already know if your house has hard water. Hard water exacerbates and even causes skin conditions. Those prone to psoriasis or eczema will notice their conditions flare up when bathing and washing their clothing in hard water. The hard water chemicals are drying and caustic, and are one of the most common triggers for skin irritation. 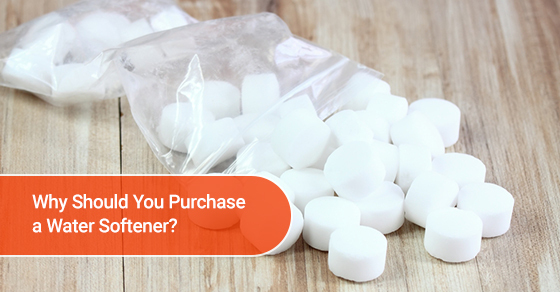 The great news about purchasing a water softener is that your investment will pay for itself in about two years. The combined total of money you would pay for pipe repairs due to hard water damage, increased utility cost from inefficient washing and additional cleaning products far exceeds the lifetime savings a water softener brings. Purchasing a water softener is a great move for your family and budget. Contact your local plumbing service to inquire about which type would be best for your home and living situation. There are many types available to suit every residence style and price range. Especially if you or a family member suffers from a skin condition such as eczema or psoriasis, a water softener can be a saving grace for your health and comfort.